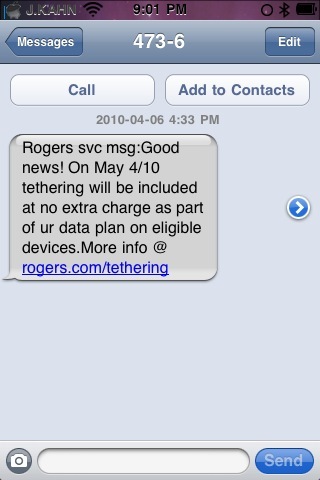 I received a text yesterday on my Rogers iPhone letting me know that Rogers customers will have access to free tethering starting May 4, 2010. There was some discussion about Rogers following other carriers that have begun to charge controversial amounts of money for tethering, but this is definitely proof right from my own iPhone that free tethering through Rogers is real. Hopefully this will make AT&T and other carriers around the world think about offering tethering free of charge as well. See the image of the text I received below.